Neither of these two teams have won yet in the Eurocup this season and this is the first time that these two teams have played each other in this tournament. Therefore, whoever grabs the win in this game will feel as though they are moving in the right direction but this means that there is likely to be a lot of pressure on both sides. This is the first home game of the campaign for the Skopje side and they come into this game after a cruel defeat in their last game. They lost out right at the buzzer, but they should take some comfort and confidence from their display. They will be looking for Stefan Sinovec to deliver again as he grabbed 20 points on that game while Uros Lucic and Xavier Thames both provided 17 points in that defeat. A home game provides a good opportunity to get off to winning ways but there is no doubt that this will carry an element of pressure as well. One thing to look out for is that both teams defensive record isn’t good so far. 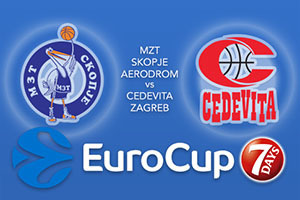 The hosts shipped 90 points in their last game while Cedevita are offering up an average of 90.5 points to their opponents. This means there is a need for both teams to work harder in protecting their own basket. Going forward, Cedevita will be looking for Miro Bilan to step up and be counted. He has an average of 16 points per game for his side while Scott Hopson has provided an average of 14 points per game. Karlo Zganec has also played a part, providing an average of 11 points in his two games. After two defeats, the Zagreb side will be desperate to get a win on the board. The bookies are convinced the away team will get back on track in this game but with the home fans cheering on their heroes, there could be a big night for the Skopje fans. This is why you should take MZT Skopje Aerodrom at +8.5, which you can find on offer at odds of 1.90. For the Over/Under market, look to go OVER 155.5 which you will find at odds of 1.90. Bet Now!